Think of this as an experiment in data art. 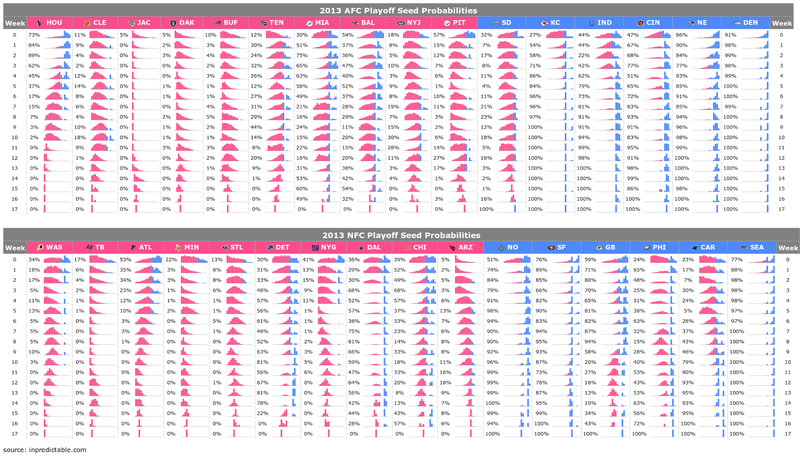 Image Link: Playoff seed probabilities for every team and every week of the 2013 NFL season. Okay, maybe art is a bit of a stretch (I'm a color blind codemonkey, not a graphic designer). As a reminder, blue=Seeds 1-6 (playoffs), red=Seeds 7-16. Bars are in ascending order from seed 16 to seed 1, with the height of each bar proportion to that team's probability of achieving that particular seed. The probabilities are generated from my team rankings and a 10,000 run simulation of the remainder of the season. I debated whether to stack this vertically by week or team. Stacking by week puts each team in its own column, allowing one to easily see how each team's outlook evolved from week to week. The Broncos, by and large, are who we thought they were. The Falcons, on the other hand, were not (as their distribution shifts from blue to red, it's almost as if they're bleeding out).